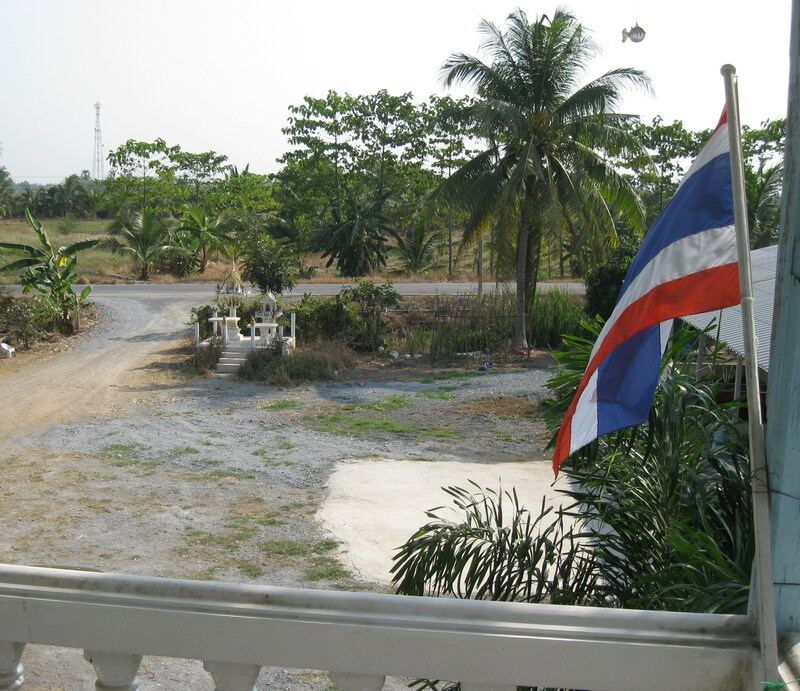 We’d been in Thailand for less than a week and the Peace Corps thought we were ready to be thrown into the lion’s den. Just about the only Thai I knew was Hello/Goodbye, Thank you and Delicious. I could also – very slowly – count to ten. 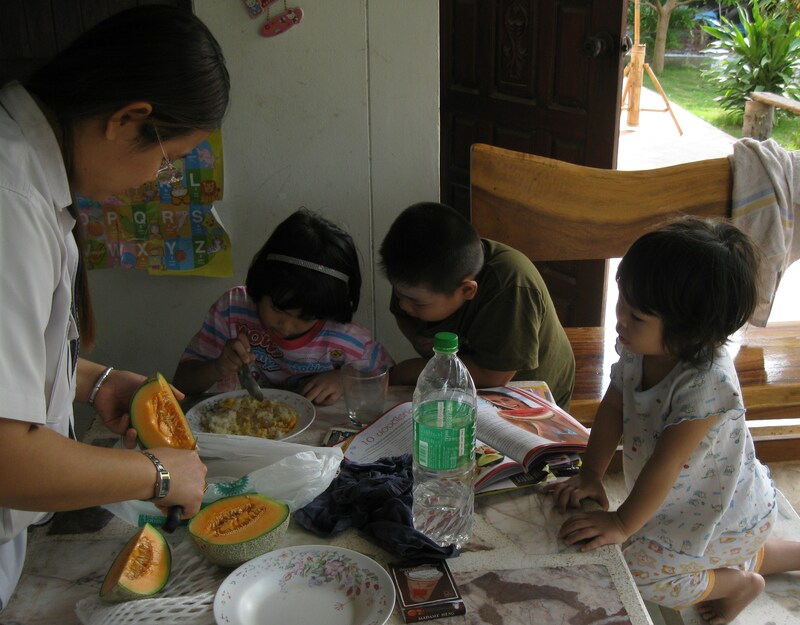 It was with this knowledge and an English-Thai dictionary that the Peace Corps set all 66 volunteers up with host families to spend the next 10 weeks. The conference room in the hotel in Ayutthaya was filled with every volunteer, staff member and one to four representatives from 63 host families (there are three married couples in our group). It was a Saturday, so we’d go back to our respected host families for the remainder of the weekend. Volunteers sat together on one side while the families were on the other. I was hoping my host family would be cool with the little knowledge I had of Thailand and its people. It was a bit like being in the NBA draft and thinking Please don’t let it be the Clippers. Any team but the Clippers. C’mon Mavs! Of course, I didn’t know any of the Thai people on the other side of the room, so it would take weeks before we could separate the Clippers from the Mavs. Once the envelopes were opened, all awkward hell broke loose. Everyone was feigning happiness and surprise to their new roommates. Sure, people were happy, but they really weren’t sure why. I met my new host mother, told her (through my language instructor) that it was nice to meet her and what my name is. She looked like a nice Thai lady. All I kept thinking was This is so damn weird. I’m about to get in a truck with this woman and she’ll take me to her home to live and I won’t see another American until Monday morning. I don’t speak Thai and she doesn’t speak English. This is the craziest trip I’ve ever been on. Her son was waiting in the truck downstairs. I took my suitcase and put it in the bed, we picked up my bike from the school and were on our way. My host mother, Sombot, kept asking me questions on the drive back. Most of them I didn’t understand, so just started saying some of the things I did know. I’m 32 years old. I’m from the state of Minnesota. 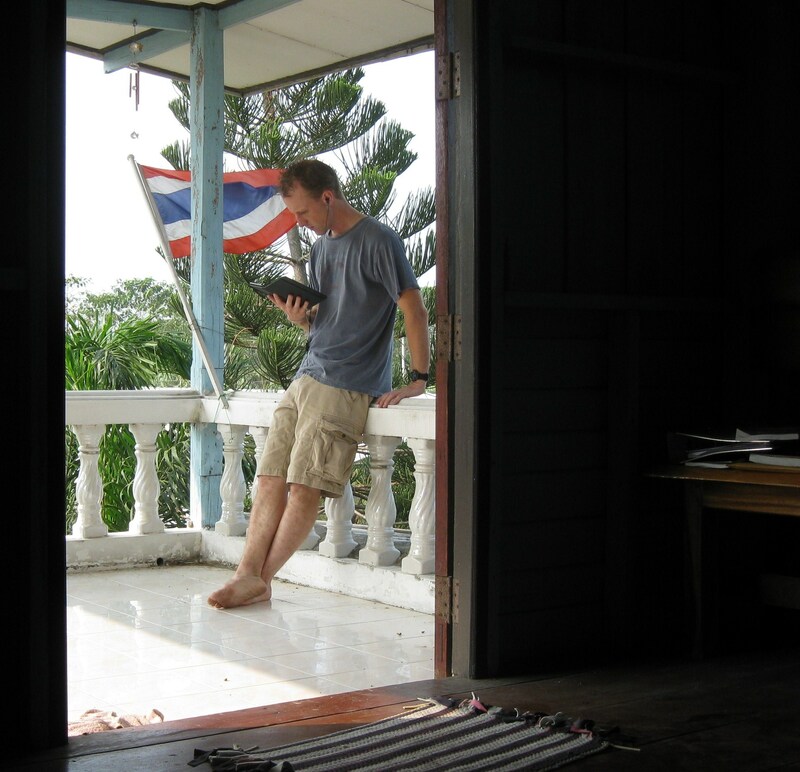 It was these first few weeks in Thailand when I realized how much can be understood by simple body language. My arms, elbows, hands and fingers did a lot of moving around to explain things and my acting skills certainly improved. These things would impress my host mother. She got a lot of laughs out of the crazy white dude she was letting stay at her place. The view from the balcony of my room during pre-service training. When we got to my new home, I was very happy to see there was a flush toilet and I’d have the entire upstairs to myself. I had been wondering if I’d be sharing a room. 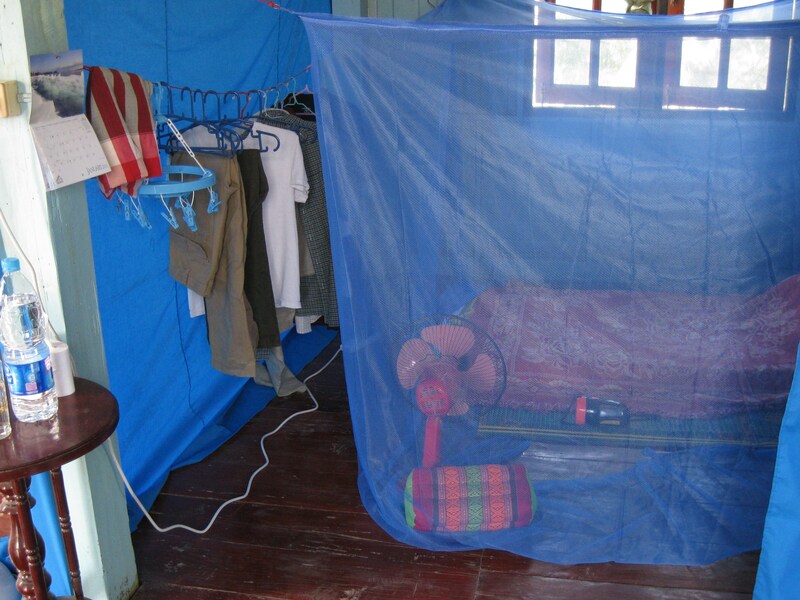 I was introduced to her other son and his family as they assembled my mosquito net around my mattress. After hanging around for about 30 minutes, they started talking to me. I didn’t know what it was about until they pointed at their truck and made gestures of putting a spoon in their mouth. I was hungry, so getting in the truck to eat sounded like a good idea. Even if it wasn’t, what was I supposed to do? No thanks, I’ll get some chow on my own. My well-being was in their hands. We drove 500 yards up the road to a roaring party. There was bad karaoke blaring from speakers, neon lights, a dozen round tables in the lawn and a lot of staring Thai people. They sat me down at a table near the stage and dance area and immediately began putting food in front of me. When people came to talk to me I couldn’t hear anything over the music and bass blaring, plus the fact that I couldn’t understand much Thai. My first morning with my host family. At this point the kids didn't know what to think of me, therefore, left me alone. After sitting awkwardly at this table for about 10 minutes, my salvation showed up and her name was Erin. Yes, that Erin. Erin was my closest neighbor in the tambon of Sam Bandit and her new family dragged her here as well. Yes! An English speaker! Not only is she an English speaker, but I’ve met this girl and talked with her a few times and she’s cool! Bonus! We did our best to have a conversation about our first few hours with our new families and how we were handling it despite the horrible music. It wasn’t long before my other neighbors arrived: Lynn, Joe, Meaghan and Dom. Joe and I were handed beers and whiskey. The women were not, but this didn’t stop Lynn from sneaking some from us under the table. Then they wanted us to dance. We had yet to be taught how to dance like the Thais, so I’m sure I looked pretty funny. Wait, I look pretty funny anyway, so I guess the lack of formal training didn’t matter. A woman in a pink polo shirt kept dancing next to me and whenever I sat down she’d call me back. That was okay because whenever I sat down, whiskey was put in my face, so dancing was the lesser of two evils. I still had some remaining jet lag from the flight from Tokyo so mass amounts of hard alcohol was not the answer. Erin and I awkwardly made our way through the circle of dancing Thais, chatting now and then about what the hell was going on. At one point a drunk woman tried lifting Erin’s skirt up never having seen legs that long. I remember looking around and not finding my host parents. Are they gone? I guess they didn’t like me. After a few hours of sipping beer, bad dancing, screaming in my new friends’ ears, eating spicy food and slapping mosquitoes on my neck, I was taken home. I slept well. The next day, Sunday, was my first chance in over a week to breathe. Eight days earlier I woke up in my parents’ house, ate some Cheerios and pet my cat. That afternoon I met 65 new friends in a snowy Philadelphia. The next day was spent at JFK airport waiting for a delayed flight to leave. The next was waiting for the next available flight from Tokyo. After we finally got to Bangkok, we were up at 7 a.m. the next morning and in bike training by 8 and then language training began a few days after that. But on this Sunday, I had nothing to do. I told my host mother I was going for a bike ride (I looked it up in the dictionary) and she told me no, I should stay at the house. I was six-years old again. Luckily, I didn’t mind and they had a hammock. I spent the entire day in that hammock reading I Married a Communist by Philip Roth and it was just what I needed. I got up a few times to play with the kids. They fed me three big meals that day. Maybe this isn’t going to be so bad. A frequent sight after returning home from training everyday. This entry was posted in Peace Corps and tagged dallas mavericks, los angeles clippers, peace corps, thailand, training by Jeff Jackson. Bookmark the permalink.